Noise levels are an issue at Nashville’s Ascend Amphitheater since the park is located among commercial and residential buildings. To remain compliant with city restrictions, Morris typically employs d&b’s NoizCalc predictive software to precisely define the system’s coverage. Granular control is achieved by wiring one box per amplifier and using ArrayProcessing in d&b’s ArrayCalc software. Canada’s 2,500-seat Southern Alberta Jubilee Auditorium (SAJA) in Calgary underwent a renovation costing over $90 million coinciding with the province’s centennial in 2005. There is a saying that a shark must constantly swim or else it might drown. The same might be said of music and entertainment venues. Whether they are new, old, or revitalized, they need to stay up to date with production technology or they may risk losing their audience. Metro Nashville Davidson County unveiled Riverfront Park and Ascend Amphitheater in 2015 on the last piece of green space in downtown Nashville, an 11-acre site along the Cumberland River formerly occupied by a power plant. The venue, which has a capacity close to 7,000 in permanent and temporary lawn seating and premium boxes, is managed by Live Nation. 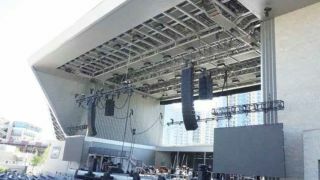 Like many such venues throughout North America, Ascend Amphitheater has no permanently installed production sound system. Instead, touring artists bring in their own rigs. For other events, the city calls on a local provider such as Morris, which has handled Fourth of July events, the CMA Music Festival, and symphony concerts at the venue since it opened. “Generically, it has been a d&b audiotechnik J rig,” said Joseph Logsdon, account manager at Morris. The company began outfitting tours for the country band Alabama 25 years ago, and in 2013, added an integration division. The rig size may vary, but for the July 4th show, for example, “We did 32 boxes of J—a combination of J8s and J12s—and 32 ground-stacked J-SUBs. Then we did a side hang of d&b Vs plus V10P front fills,” Logsdon said. Noise levels are an issue at the venue since the park is located among commercial and residential buildings. To remain compliant with city restrictions, Morris typically employs d&b’s NoizCalc predictive software to precisely define the system’s coverage. Granular control is achieved by wiring one box per amplifier and using ArrayProcessing in d&b’s ArrayCalc software. “Having as much energy inside [the venue] where you need it and as little outside that space as possible has been helpful,” he said. In 2009, independent production company Another Planet Entertainment (APE) reopened Oakland’s 2,800-capacity Fox Theater, a former movie house originally built in 1928, following a $75 million retrofit. Supplied by Pro Media/UltraSound, 14 flown LYON modules per side are complemented by ground-stacked 1100-LFC low-frequency control elements. Three 700-HP subwoofers are also flown above center stage and there are additional Meyer boxes for fill. In 2009, independent production company Another Planet Entertainment (APE) reopened Oakland’s 2,800-capacity Fox Theater, a former movie house originally built in 1928, following a $75 million retrofit. The company also exclusively operates and promotes events at venues including the Greek Theatre at UC Berkeley, San Francisco’s Bill Graham Civic Auditorium, and The Independent, plus the annual Outside Lands and Treasure Island music festivals. “We had a shootout with all the major companies when we opened the venue and ended up going with Meyer Sound,” said Tony Leong, production manager for APE. The multi-use venue, which stages everything from spoken word to music to comedy, initially installed a Meyer Sound MILO rig, but recently switched it out for the company’s new LYON system. Supplied by Pro Media/UltraSound, 14 flown LYON modules per side are complemented by ground-stacked 1100-LFC low-frequency control elements. Three 700- HP subwoofers are also flown above center stage and there are additional Meyer boxes for fill. Canada’s 2,500-seat Southern Alberta Jubilee Auditorium (SAJA) in Calgary underwent a renovation costing over $90 million coinciding with the province’s centennial in 2005. But the building—which has a northern twin in Edmonton—was opened in 1955 and its construction reflects an older aesthetic. “Some of the walls are three feet thick, so getting any wireless signal from one place to another is nearly impossible,” said Mark Belkie, the SAJA’s technical director–audio. Toward the end of 2016, Belkie and his team installed Clear-Com’s new FreeSpeak II (FSII), a key component of a combined wired/wireless intercom system comprising the Clear-Com Eclipse HX-Median Digital Matrix system, two FSII cards, 25 FSII wireless beltpacks, 20 wired partyline intercom positions, and distributed transceiver antennas. During the renovation, said Belkie, “We ran Cat-5/6 cable everywhere in the building.” That enables him to add an antenna anywhere that wireless reception is a problem and run it back to the Eclipse HX. There’s nothing that beats the thrill and experience of a live concert experience for music lovers, yet the reality is that attending a concert can oftentimes be complicated. There are tickets to secure, logistics to plan, business schedules and personal obligations to coordinate around. And for some people, the experience of a crowded music venue just isn’t all that pleasant sometimes. As video on demand and live streaming consumption models have proliferated in home entertainment, there’s a growing fad to bring the concert into the home. The so-called “couch tour” is being embraced by young live music consumers and furthered by bands like Metallica, Bruce Springsteen, Pearl Jam, Phish, Red Hot Chili Peppers and many others. Live production companies, music festivals, and venues are catering to an appetite for pay-per-view revenue sources. Qello Concerts is an OTT streaming service for full-length concerts and music documentaries on demand, a sort of Netflix for live music. Qello recently launched a Live section to further support the couch tour movement. Venues like the Capitol Theater in Port Chester, NY and Brooklyn Bowl have invested in the production gear, and via a live streaming partner have select concerts available for purchase by home viewers on any mobile device and all the major OTT boxes. So how does it work for a venue? You’ve got some cameras, maybe just one even, there’s a producer staffed, in-house or outsourced to a production company, there’s encoding either on premise or in the cloud, and from there, it’s mostly bandwidth. There is some paperwork involved, having the artist sign off, sometimes the label needs to sign off, and Qello will cover the performing rights organizations. The benefit for Qello is that a venue can help drive fans to the platform and grow its subscriber base, along with growing its content sources and thus enhancing the service.